In order to turn your tresses pink, green, blue, or any wild hue, you absolutely need to succumb to bleach. And when not done properly, it can spell tragedy that's beyond repair. This is why we turned to Jon Bantigue, one of the owners of Azta Urban Salon, for the things you must know before you set an appointment. How long does it take to achieve rainbow hair? Azta carries three major categories of rainbow hair, namely Brights, Pastels, and Metallics. Jon explained that the bleaching required for your mane's natural hue is determined by the final color you want to achieve. You can't just have your tresses lightened and expect Lisa Frank results right away. “Each bleaching cycle takes around one and a half to two hours to complete," said Jon. If you're aiming to dye your locks in electric shades, like pink, blue, red, green, orange, or yellow, you have to be ready to spend a significant amount of time in the salon. “For Brights, which require two cycles of bleaching and Olaplex, an approximate service time would be around four and a half to five hours.” Olaplex is the treatment they give to nourish chemically-treated hair. Now, it's a totally different story if you covet pastel or metallic (rose gold, silver gray, golden blonde, ash blonde, mauve, chocolate mauve, dusty lavender, and denim blue) hair. Expect to sit in the salon chair for seven to eight hours! “Pastels and Metallics generally require three or four [bleaching] cycles,” Jon revealed. You better bring your baon so you won't go hungry in the salon! But if you do not have the *patience* or time to spend almost a whole day in the salon, or your scalp is sensitive to bleach, you can split the bleaching sessions into two. “Some guests opt to go for the whole procedure in one session. Others opt to split the session into two visits of around three to four hours each,” Jon suggested. Since you're stripping off color from the follicles, expect the ends to be dry. You may even need a trim right after a bleaching session. How quickly does rainbow hair fade? “Fact is, special colors like this may begin to fade gradually as soon as you begin to wash it. They are semi-permanent in nature, unlike most traditional shades,” he explained. “As a general observation, these semi-permanent colors fade up to as much as 80% over a period of three months (if the right shampoo and conditioner is used), leaving a hint of the original hue at that point in time. “The first two weeks you may notice a drop of 20%. Then the fading becomes slower and more gradual over the next few months until it stops at around that point wherein 80% has washed out. You can opt to have your locks retouched at Azta for about P700-P1,000 (depending on thickness and length) to refresh the color and if you really, really want unicorn hair as your signature look. How do you maintain rainbow hair? According to Jon, dyeing your follicles in a non-traditional hue involves a lifestyle change. “It requires responsible post-service maintenance if you want to get the most out of it. Those who wish to try it out, but opt not to follow through with the proper shampoo and conditioner usually end up frustrated particularly as it begins to fade fast. If you’re spending for it, might as well add a few more bucks to ensure you maintain it well with the right hair cleansing and conditioning aids,” Jon advised. “The regular shampoos and conditioners, most of which contain an ingredient called sulfate, may wash off [rainbow pigments] significantly within just a few washes. On the other hand, using purple shampoo (like Tigi Bed Head Dumb Blonde) and a sulfate free conditioner (like the one by Human Nature) prolongs the lifespan of the color and actually leaves the cool pigments on your hair [as it] fades,” he explained. Here are the other products you can use to keep your dye job looking fresh AF. How much does rainbow hair cost? Just like any other salon treatment, it may create a dent in your monthly beauty budget. The price will also depend on the type of dye job you want. Highlights, of course, would cost less than a full-head color. “Peekaboo highlights with three colors for example, may go as low as P1,800 for short, chin-length hair, [and] P3,300 for longer hair that extends a little below the shoulders,” said Jon. Now for those who dare to take the DIY route, the peeps of Rainbow Head, an authorized retailer of famous hair dye brands like, Manic Panic, Artic Fox, and Lunar Tides, shared how you can transform your locks into magical hues right at home. Although it is indeed possible to do it yourself, it’s best to have another person help you out. “[It] would be great if you have an extra pair of hands of course, but yeah, you could do it yourself. We have lots of clients who do it themselves. But we always suggest [to] first timers, especially when bleaching, to seek extra help if they are not yet confident about things. Once you get the feel of it, it is really possible to do it on your own,” Rainbow Head disclosed. Plus, you also need to use toners, as these correct the brassiness of your hair. If you neglect this step, your bleached locks might look a bit rusty. Is it cheaper to color and dye your hair yourself? Unlike the thousands that you may spend in the salon, most of the ready-to-use hair colors cost around P550-P900 only. But then again, when it comes to bleaching—the core process where your mane’s health and dye vibrancy depend on, it’s always best to hand it to the pros. What are the best rainbow hair color products I can use to color my own hair? Again, if you're taking things into your own hands, you should be picky with what you put on your hair. L'Oreal Quick Blue is the bleach brand you can rely on, and Manic Panic, Lime Crime, and Artic Fox are vegan and cruelty-free dyes that won't damage on your locks. I can't decide if I really want rainbow hair. Is there a guide that I can watch? Wengie, a popular YouTuber who changes her hair color every now and then, has lengthily discussed the difference between going to a hairdresser and doing it yourself based on first-hand experience. 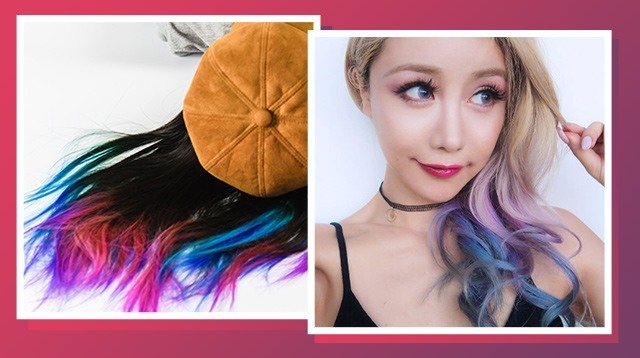 Being Asian with naturally dark hair color, Wengie explained that for pastel and bright dyes to take effect, the hair must reach a light yellow color. If not, the end result won't show the exact shade you're aiming for. She also warned that you may have to chop your hair off to remove brittle tips and split ends. Also, you should be ready to have your roots retouched often, "Because hair grows, and there is nothing we can do about that," she said. Our local salons charge differently, but on the average, expect to shell out about P1,500—P2,500 for a one or two-inch regrowth. Just like what Jon disclosed earlier, Wengie shared that fading is inevitable. "Expect your hair to fade into all sorts of weird colors in between," she warned. Wengie wants you to consider these factors first when you're discerning whether to DIY or let the professionals handle it: budget, skills, and your tolerance for possible errors that may happen during the whole process. While a salon trip may sound pricey, Wengie said this is the best option for newbies: "The great thing about using a hairdresser is you'll get the right color the first time." She also revealed that when you work with an excellent dye technician, he can give you a realistic timeline on when (and how) you'll get to your desired shade. This is why researching for a reputable salon with experienced staff is important. It's all about trust at this point. Now if you like to try DIY because you're on a budget, Wengie advised to ask someone else to do it for you. "You actually need a second pair of hands," she said. "Once you get to the back of your hair...it's really, really hard to do it yourself and properly because you can't see." Additionally, the designated individual should know how to do it. "That person [who] will be helping you will need the skills to be able to apply the color evenly as well," she said. She also reminded that timing is important. Bleach dries out easily so you have to wrap it with plastic film to retain mositure. Also, the roots lighten faster because of the scalp's warmth. "If you put it all evenly on your hair, your roots will be like a light yellow whereas [the rest] of your hair would still be like brown," Wengie explained. Another possible setback she wants you to consider is the possibility that something may go wrong when you DIY. Hairstylist spent years of training and you didn't. You must have realistic expectaions. "Things will go wrong. You'll go patchy. You might not get the right color the first time and [may] have to redo it. you may have to spend the week with orange hair," she cautioned. "I've done it myself multiple times, and every time it has [ended] with disasters that I've just [had to deal with]," Wengie divulged. She recommended that before jumping into it, it is still best to speak to a professional to ask about the technical stuff you need to know, like the volume of developer and the right bleach proportions. How hard it is to maintain rainbow-colored hair? It's expensive to get your hair bleached and dyed in a wild color when done in the salon. You should scout for one that is reputable and check the results from their previous clients. Doing it by yourself is risky—your dye job might be patchy, and you may damage your hair in the process. Maintenance is a b*tch. You have to set a budget for products that are sulfate-free and would preserve the color. Also, root retouch is another factor you have to consider, and this may cost you around P1,500–P2,000 for the bleaching alone—toning and dyeing not yet included. It's definitely a lifestyle change.